These Windows 2000 administration tools will help you get through the day more quickly. In this era of consoles and wizards, I still like to do things the old-fashioned way. That is, I use the native tools found in folders accessed from the Start menu. Heck, I sometimes pr prefer to execute commands from the command line! In the spirit in which this column was founded - to help newbies learn the ins and outs of Windows 2000 - this month I explore the Administrative Tools folder, something that you may often take for granted. Let's begin the Administrative Tools folder journey at the Start button. (Note: For this column, I'm assuming you're using Win2K Server, not Win2K Professional). In the Programs group, you'll find the Administrative Tools folder (see Figure 1). You can also access the Administrative Tools folder from Control Panel. Starting at the top, I'll list the program item and a definition of each in Table 1. Following that, I'll provide selected screenshots of tools that I've not discussed in the last year of this column (If you've been reading this column on a regular basis, you're probably already familiar with some of these cool tools such as Active Directory Users and Computers). Table 1. 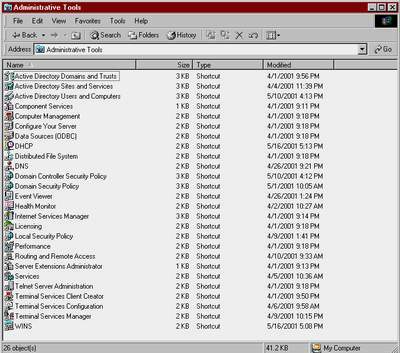 Windows 2000 Administrative tools and what they do. Active Directory Domains and Trusts Helps you manage domains and trust relationships between domains. This tool is more enterprise-centric than some of the others. AD Sites and Services Helps you to define sites and manage data replication, including information about domain controllers, sites, replication between sites, and replication of network service configurations. To be honest, this tool is more sophisticated than it first appears and is likely to be used by larger organizations. AD Users and Computers This is a tool for everyone in any company running Win2K Server. It helps you administer and publish information about users, computers and other objects. Note for Small Business Server 2000 (SBS) users: It's recommended that you access this component via the Small Business Server Administrator Console. Component Services A rarely used tool that helps you to configure and manage COM+ applications. Computer Management The Win2K Server Swiss Army Knife. It helps you manage disks and provides access to other tools you can use to manage local and remote computers. Again, SBS user should access this component by using the Small Business Server Administrator Console. Configure Your Server This is the on-screen Wizard that appears the first time you boot Win2K Server (and each time until you turn it off). It helps you set up and configure Windows services for your network. Data Sources (ODBC) Helps you to add, remove and configure Open Database Connectivity (ODBC) data sources and drivers. DHCP More important than you might imagine, this tool helps you manage Dynamic Host Configuration Protocol (DHCP) servers on your network. The DHCP service centrally manages Internet Protocol (IP) addresses and other related configuration details that are used on your network. This tool has more nooks and crannies than you might think and is worth further exploration. Distributed File System A somewhat less-used tool. It helps you manage Distributed File System (Dfs), which is a single hierarchical file system that provides a logical tree structure for file system resources on the network. DNS One of the most important tools in Win2K Server. This jewel allows you to manage the Domain Name System (DNS), which allows client computers on your network to register and resolve DNS domain names. Domain Controller Security Policy This tool, shown in Figure 2, lets you view and modify the security policy for the DC's organizational unit. 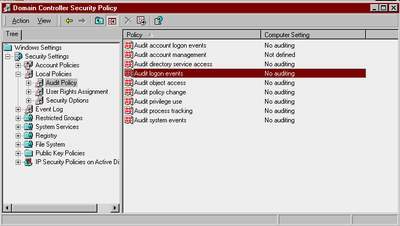 Domain Security Policy Closely related to the tool above, this one enables you to view and modify security policy objects for the domain, such as user rights and audit policies. Event Viewer A very popular tool, it allows you to view monitoring and troubleshooting Event Log messages from Win2K and other programs. Health Monitor For SBS and BackOffice 2000 only. This tool lets you closely monitor Win2K and application behavior by using data collectors. You can also configure alerts for notification purposes. You can access this tool via the Administrator Console in both SBS and BackOffice 2000. Internet Services Manager Lets you manage Web servers that have Internet Information Services (IIS) installed on them and are running a Web (HTTP) service. This is where you can also manage the FTP service, if it's installed. Licensing Enables Win2K Server users to manage client access licensing. SBS and BackOffice users would manage licenses from the Administrator Console. 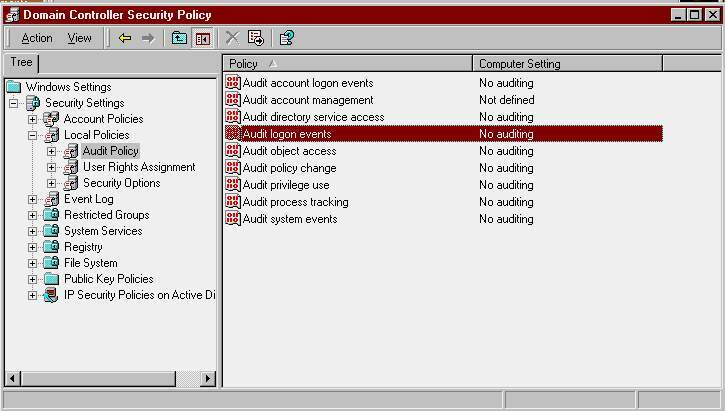 Local Security Policy This tool enables you to view and modify local security policies, such as user rights and audit policies. Performance This is my favorite. Performance Monitor (also known as System Monitor) displays graphs of system performance and configures data logs and alerts. Enables you to manage Routing and Remote Access (see Figure 3), which provides multi-protocol LAN-to-LAN (local area network), LAN-to-WAN (wide area network), virtual private network (VPN), and network address translation (NAT) routing services. 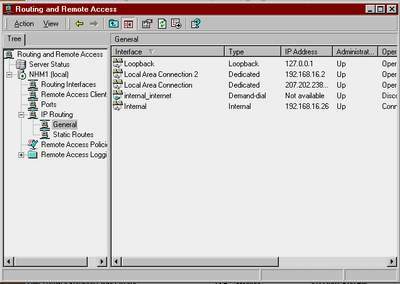 In addition, Routing and Remote Access also provides dial-up and VPN remote access services. Note: You have to be careful with this tool if you're also running Microsoft Internet Security and Acceleration Server 2000 (ISA). In this case, you'll want to run the ISA VPN Wizard, not the RRAS VPN Wizard. The RRAS VPN Wizard will close almost all ports except those used for VPN traffic, which, typically, isn't what you want. Services I use this tool daily. It lets you start and stop services on the server computer, and it can also be viewed via the Computer Management snap-in listed above. Allows you to create the two diskettes needed for installing the Terminal Services client-side application. Note: In Win2K Server, the Terminal Services client uses two diskettes (Terminal Server under Windows NT 4.0 Server only used one diskette). Terminal Services Manager Use Terminal Services Manager to manage servers and connections and monitor the sessions, users and processes of Terminal Services servers in trusted domains. Terminal Services Licensing Enables you to register and track licenses for Terminal Services clients. WINS An oldie, but goody. 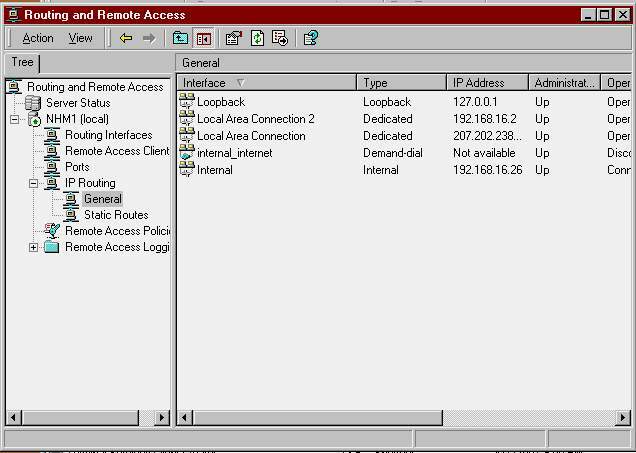 This tool enables you to manage the legacy Windows Internet Name Service (WINS), which provides a dynamic database service that registers and resolves network basic input/output system (NetBIOS) names to IP addresses used on the network. So there you have it, for another month. Keep this list hand as a quick reference to all that's good, bad and indifferent in the Administrative Tools folder.